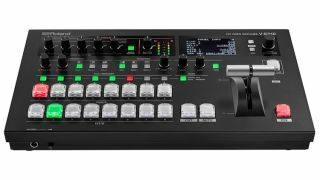 The What: Roland Professional A/V is now shipping the V-60HD, a compact, integrated video switcher and audio mixer. The What Else: Compact and portable, the V-60HD supports six video channels from a variety of inputs, including 3G-SDI, HDMI, and RGB sources with scaling on HDMI and RGB inputs to support both video and VESA resolutions from 480i up to WUXGA. A de-interlacer enables 1080i and 1080p SDI video sources from multiple fixed-lens, PTZ, or ENG-style cameras to be used simultaneously without the need for an external signal converter. The V-60HD also supports still image capture and import with two dedicated cross points to have images ready to go and easy to switch to. Program, preview, and AUX bus sources enable flexible outputs for multiscreen environments such as churches, conference centers, hotels, and trade show facilities, supporting a confidence monitor, presenter notes, plus a main output for IMAG. The dedicated AUX bus may be assigned to any of the four discrete SDI or HDMI outputs providing switching from the eight input channels, including four SDI, two HDMI, or one RGB and two still images uploaded via the USB port. A front-panel, 3-inch LCD display allows quick access menu navigation and access to switcher parameters. A multiviewer supports program and preview feeds and up to eight video sources with audio meters and labels. A free software application, V-60HD RCS (Mac or PC), provides setup and control information for the unit through a network port. For fixed installations, the V-60HD can be remotely controlled through the LAN or RS-232 port using touchpanel or other programmable interface devices. The LAN port also supports Roland’s new Smart Tally system for PC, iOS, and Android devices, providing wireless tally to mobile devices from a Wi-Fi access point. In addition to enabling still image uploads, the USB port allows the user to save program files and memory settings plus software updates. The professional user interface also includes broadcast switcher quality cross-point buttons with PGM/PST LED color indicators, a rugged T-bar, and DSK (downstream keyer) quick-edit knobs for key level and gain. Two sets of dedicated controls enable center framing of split and PinP (picture-in-picture) placement. The DSK can be used to apply up to three layers of composition incorporating titles, song lyrics, logos, or graphics coming from the video sources. The DSK supports both luminance (black/white) and chroma (blue/green) keying for compositing two video sources, plus the additional layer of PinP, plus background video. Video processing enables cut, mix with cross-dissolve, and NAM/FAM transitions, with up to 30 different wipe patterns. Seamless transitions between six video sources and two still buses are enabled by time-based correction and frame synch. The V-60HD also features an 18-channel audio mixer with four TRS/XLR combo jacks with 48V phantom power, an RCA stereo pair, plus audio de-embed from the six video inputs. Audio processing capabilities include dynamics and effects, such as a high-pass filter, gate, compressor/limiter, three-band EQ, delay, and the ability to select audio-follows-video channels. The unit’s multichannel audio embedding function allows users to select which audio source to embed separately to SDI outputs 1 and 2, for example, to fix audio issues or separate multi-language audio sources post event. An auto-mixing function automatically adjusts the audio level based on weighting, ensuring even levels for the room mix, recording, and web streaming.